Big chubby news came out of Nintendo recently: Their next DS version is imminent, and it is a much larger beast than we are used to. The DSi LL (DSi XL for the western market), is a whopper compared to its older sibling. Its screen is fully 93% larger than the original DSi. Take that poor eye sight. This week, Scott and I tackle this behemoth and discuss the current state of handhelds, what we've been playing on our itty-bitty screens, fat fingers, developing for limitations, and the elderly market. You can find more information, including nice photographs, in our show notes, and we encourage you to leave thoughts of any size in the comments section. You guys have excellent timing. Just this week I decided, after watching all these people in Japan play around on their DS lites on the subway commute, that I would get a handheld when I got back. But I was having a horrible time trying to figure out which one. For a while I was leaning towards PSP, but you pulled me back. So LL is just the Japanese way of saying "extra large." You see it on t-shirts and things (LLL is XXL). 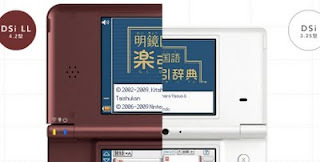 The DS LL comes on on November 21st, so I'll try to find a store that has it and check out the screen for you. That's the one I'm leaning towards getting now, but I agree with Scott's ominous statement that it feels like they'll just release something much better in a year, or even a few months. While searching the internet for the best handheld, I did come across something else that sounds interesting. Have you heard of the Pandora? http://openpandora.org/ I'd be interested to hear what you think about it. This generation I have bought and sold a PSP and I have also only really held onto my DS because Scribblenauts was coming. (and I'm sure you know how that game went down). I recently upgraded my iPod to a touch model and have been really enjoying how Apple have set up the system. Incorporating the games into a device I was already carrying around constantly allowed me to feel like I'm not carrying around a million gadgets with me. The price point on the Touch is very good because it provides a new space for even shorter, leaner gaming experiences that don't feel are overpriced and also suit the handheld format perfectly. The games that have stood out for me since picking up the Touch have been Spider, Canabalt, CivRev and Eliminate Pro. I've also delved into the Beneath a Steel Sky remastering but find my lack of affinity for adventure games a hindrance more than the platform which suits the genre perfectly. I don't think I have played my DS since purchasing the Touch and I'm only really hanging onto it just in case a title arrives that takes my fancy. I often find that when it comes to picking up a new DS game I seem to be much more inclined to pay a bit more money to get a new game for my console instead. For me, it was New Super Mario Bros. and Yoshi's Island 2 that made me buy a DSlite. Now I own as much as three DS games...plus a whole bunch of GBA games, since I missed out on that console. I played Zelda Phantom Hourglass at Games Convention a couple of years ago, the funny thing is that I had the same problem with it as you seem to have, it just feels like my hand always blocks my sight no matter where I put it. I'm still interested in getting a PSP some day(not the Go Version though of course) basically because of God of War: CoO and the Metal Gear Games. I wonder what Sony's strategy for the future is though, since they seem to have lost the battle against Nintendo on both battlefields, portable and stationary consoles. Well, thanks for the unexpected language lesson! The handheld market is definitely a weird scene, but I still think the DS offers the best well rounded experience from a consumer perspective. Thanks for the Pandora link. I haven't had a chance to look through the entire website, but I have a feeling that too much publicity for this project might not be a good thing; If the big companies get wind of this I'm sure they'll face a lawsuit. Seriously, I felt like the whole community really got burned by Scribblenauts. That'll teach us to be hopeful! Judging by your current handheld habits, it seems like developers have done a good job making games that fit well on the platform. Plus, the fact that the game machine itself is also a music and video player is great in terms of pocket space. I share your affinity for platforming, so the DSLite is right in my wheelhouse. It's disappointing to see Nintendo drop backwards compatibility in the DSi and DSiXL. It's really too bad about Zelda: I think the game is pretty cool from a game design standpoint, but the character movement makes it hard. I keep holding out hope that they'll port the GoW and MGS games to PS2 or PSN, since they're basically console games anyway. Of course, hoping that Sony will do something that makes sense is like hoping that the bus will come on time. The funny things is that even if they ported the MGS Games and God od War to PS2 or PSN, I would probably still want to play them on the PSP. Same thing with the two PSP GTA Games or the PSP Silent Hill, which were all ported to the PS2. I somehow always feel the need to play the games on the console they were originally desigend for, I don't know why. I rather spend time and money on ebay to get a PSone copy of FFVII instead of just downloading it from PSN.